poplovedance: Take That: Forever relevant? 2014 marks 23 years since Take That first hit the charts as a fresh-faced boyband with the catchy Promises. What happened next was the story of arguably the biggest musical force in the UK of the past two decades. Robbie Williams, Jason Orange, Gary Barlow, Mark Owen and Howard Donald reeled off a string of chart toppers before Robbie left in 1995, leaving the band on the brink. They split a year later but the remaining four members famously reformed in 2005 for an ITV documentary. What followed was the astounding rebirth of Take That, who somehow become even bigger the second time around. They hit the top of the charts in 2006 with Patience, in 2007 with Shine and in 2008 with Greatest Day. And that's without mentioning the million-selling modern classic Rule The World, which was held off the top spot by Leona Lewis' almighty Bleeding Love. 2010 saw the fairytale return of Robbie Williams and the inspired Progress album. Could this band possibly get any bigger? With over half a million sales of that album in the first week it seemed unlikely. Yet for all of the hype surrounding that album, it never produced a No.1 single (quite criminal when the excellent The Flood was the lead single) and to many observers that looked like their last chance of ever achieving one. But fast forward another four years to 2014 and it's happened. Robbie has stepped back out of his part-time role and rather more surprisingly Jason Orange has decided to leave the band. With the lowest buzz around the group since arguably the early 90s, it seemed quite likely that 2008's Greatest Day was to be their last hurrah at the top of the UK singles chart. But, never a band to be underestimated, this evening has seen the now trio's lead single from new album III, These Days, go straight in at No.1. The group have proved once again that they are invincible to market changes, member losses and anything else that's thrown at them and the cheery tune, which has been snubbed by Radio 1, has gifted them a 12th No.1 single, 21 years after Pray became their first in 1993. I, for one, am intrigued to hear III. The band peddled mature radio pop on Beautiful World, experimental MOR on The Circus and electronic influences on Progress and companion album Progressed. It has become increasingly hard to anticipate what direction the band will go in next but the bright and breezy These Days, which uniquely sees Gary, Howard and Mark sharing all of the vocal parts throughout the song, seems to have brought a fresh new dynamic to the group. 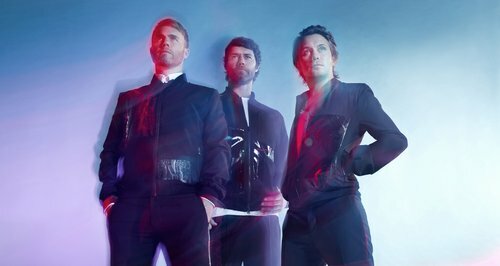 Whether III will bring them another multi-million selling album remains to be seen but, despite what the law of diminishing returns should suggest, Take That seem to be a forever relevant group that should clearly never be overlooked or underestimated. Where their 90s successors Boyzone are now wheeling out Motown covers albums and unable to score hit singles of any size and Boyzone's successors Westlife are defunct, Take That are still able to take original material to the top of the charts and into the public's hearts.